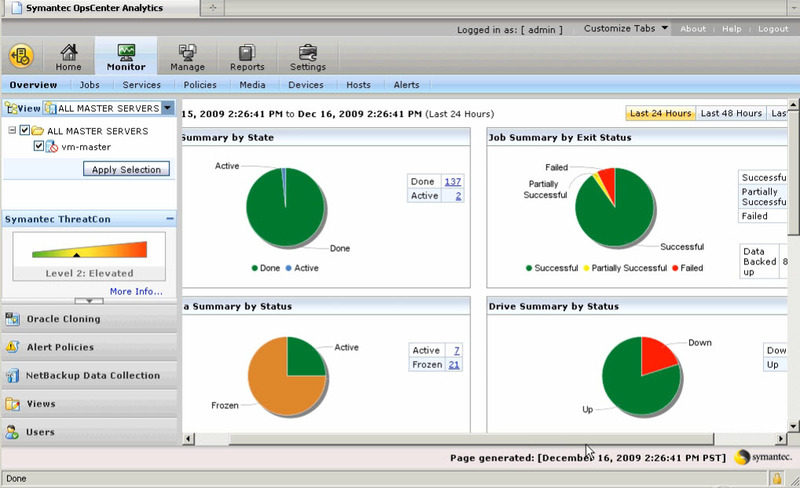 OpsCenter is a web based monitoring, alerting, and reporting application which is capable of providing these services for the NetBackup platform as well as BackupExec, Enterprise Vault and (through the optional OpsCenter Analytics component) other third party data protection products. OpsCenter 7 is a new product which replaces NOM and VBR, combining the features and capabilities both products into a single product together with significant performance and usability improvements. 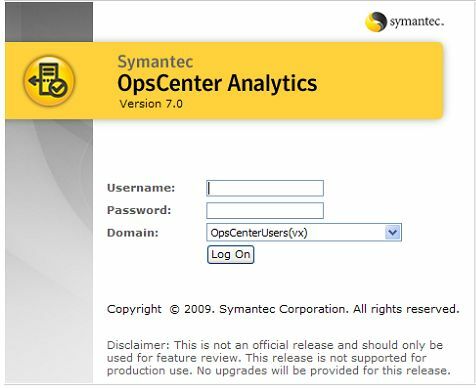 OpsCenter 7 comes in two options – OpsCenter and OpsCenter Analytics. OpsCenter is a free product which gives you the ability to monitor, alert and do operational reporting on NetBackup, Enterprise Vault, Backup Exec and PureDisk. OpsCenter server is part of NetBackup and can be deployed on master server for managing a single domain, or independently for managing multiple NetBackup Domains. It also allows you to do minor management tasks such as “upping” tape drives, restarting failed jobs, freezing/unfreezing and other tape functions, restarting services/daemons on Masters etc. The free version limits historical reporting. OpsCenter Analytics is a licensed option that is unlocked with a key. This gives the customer the ability to display customizable, multi-level views of backup and archive resources and customizable reports for tracking service usage and expenditures. It also contains tools for defining cost metrics and chargeback formulas or handling alerts as well as allowing reporting beyond 60 days. Data deduplication is a specific form of compression where redundant data is eliminated, typically to improve storage utilization. In the deduplication process, duplicate data is deleted, leaving only one copy of the data to be stored. However, indexing of all data is still retained should that data ever be required. Deduplication is able to reduce the required storage capacity since only the unique data is stored. For example, a typical email system might contain 100 instances of the same one megabyte (MB) file attachment. If the email platform is backed up or archived, all 100 instances are saved, requiring 100 MB storage space. With data deduplication, only one instance of the attachment is actually stored; each subsequent instance is just referenced back to the one saved copy. In this example, a 100 MB storage demand could be reduced to only 1 MB. Different applications have different levels of data redundancy. Backup applications generally benefit the most from de-duplication due to the nature of repeated full backups of an existing file system (Wikipedia).